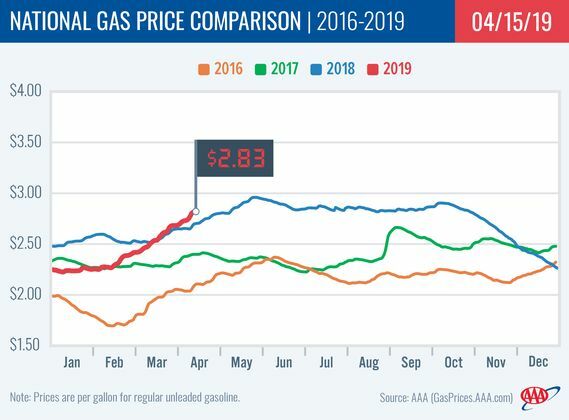 The average price of gasoline across West Central Kentucky is a penny cheaper this week at $2.617 per gallon, according to AAA East Central’s Gas Price Report. This follow’s weeks of increases; in fact, compared to the beginning of March, the average across the area is 36 cents more expensive. With a dime or more increase, Missouri (+12 cents) and Kansas (+10 cents) had the largest one week increases among all Great Lakes and Central states. Within the region, gas prices range from $2.94 in Illinois to $2.60 in Missouri. In Kentucky, the statewide average for gasoline is four cents more expensive this week at $2.69.